Home > News > Mba Entrepreneurs > MIP MBAs Help You Buy That Dress You Saw On Gossip Girl! MIP MBAs Help You Buy That Dress You Saw On Gossip Girl! Ever seen something on TV and wondered where it came from, or better yet, how you could own it? Four clever graduates from Politecnico di Milano have stepped up to this challenge by creating an app that lets you buy the things you see and love on your favourite TV shows. Movym is an app that allows you to get information on items that catch your eye while watching TV shows, and allows you to buy these items. So, say you were watching an episode of Gossip Girl and were curious about a pair of shoes that Serena van der Woodsen was wearing; you could simply click through using the Movym app, find out more about the shoes and get yourself a pair! Buy that dress! Oh what the heck, buy them both! The app has been created for both Apple IOS and Android and will go live in the first quarter of 2013. 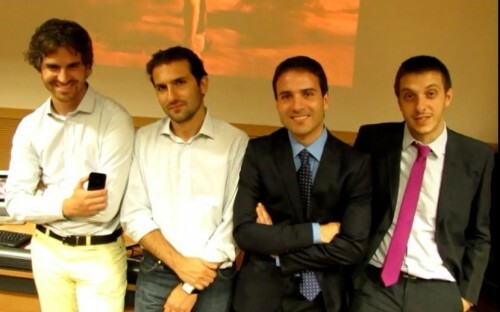 Movym’s creators, Raffaele Cicerone, Elio Di Fiore and Sebastiano Bertani met on the MIP Politecnico di Milano MBA. They were doing the entrepreneurship concentration and were determined to start a company by the end of the programme. They were joined by Davide Arconte, who has a Masters in Enterprise Processing from Politecnico di Milano. Elio, who was previously a Product Manager at Vodafone, is in charge of the company’s marketing. Sebastiano, a former telecoms engineer, is an advisor. Raffaele, a biomedical engineer, works on the company’s business development, and Davide deals with the technical side of things, working as the research and design manager. The team have commissioned "one of the best PhD teams in the world" to develop the technology. They are now meeting with TV show producers and media companies who handle product placements in TV and film and are "confident" of announcing agreements with TV shows in the next few months. We asked Elio how he is pitching the idea to TV companies, and his response was interesting. Rather than getting a cut of items sold on Movym, the TV companies can sell a premium price interactive advert to their business customers, the product companies. According to Elio, other apps in the market either don't own the right technology or deliver a poor user experience. The Movym team already have a working prototype and they’ve worked hard on patent submissions to make sure their technology is protected. Movym has the advantage that it's specifically designed to show brands placed in TV shows and "bring users to an enhanced shopping experience", he said. The initial idea to build a shopping app came to Sebastiano while he was driving his car, and wanted to buy something he heard being advertised on the radio. During a brainstorming session for their MBA project, that idea eventually became Movym. TV shows make more sense than movies as gatweay to buying products, since audiences are more likely to watch a show as soon as it's released, when the items in it are new and exciting. Pausing to do a spot of shopping is less likely to ruin the enjoyment of watching a TV show than a movie. Movym's target consumers are young adults aged between 18 and 25, though they may eventually target people up to the age of 40. Movym has already been a favourite at a number of business competitions. They recently won the Premio Gaetano Marzotto, a business competition for innovative entrepreneurs in Italy, and were finalists in the 2012 Intel Business Challenge. Movym also allows you to browse and buy furniture, and save locations and restaurants to your wish list. The item Elio would have most wanted to buy was the rucksack belonging to Dr Jack Shephard in Lost! The team expect to roll out the app in March 2013 but before that they’ll be making a stop off in California to talk with producers in Hollywood, and investors in Silicon Valley.